Black cats howled. Wind moaned. Like children everywhere, Omar is excited. 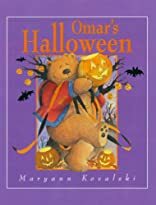 This year, after trick-or-treating with his friends, Omar is planning a party. They will bob for apples and tell ghost stories. Best of all, Omar will wear the scariest costume. It'll be so scary that someone might even faint. But like so many children at Halloween, Omar can't decide what he should wear. Nothing seems scary enough, and by the time Halloween arrives, he still hasn't decided. Omar panics! At the last minute, he had only one choice; a plain old not scary ghost . . . or is he?